Bagri Foundation’s trustee Alka Bagri and Head of Arts Chelsea Pettitt recently undertook a research trip to Kochi, Kerala to visit the highly regarded international Biennale. Always curated by an artist, this year was no different. Titled Possibilities for a Non-Alienated Life, Anita Dube writes in her introduction “at the heart of my curatorial adventure lies a desire for liberation and comradeship where the possibilities for a non-alienated life could spill into a ‘politics of friendship”. Prabhakar Pachpute (b. 1986, Sasti, Chandrapur India). Lives and works in Mumbai and Pune, India. Resilient Bodies in the Era of Resistance highlights the grievances of the farmers across India who have recently come together to protest due to declining income, crippling debt and corruption. Pangrok Sulap (collective founded in 2010). Live and work in Sabah, Malaysia. Large-scale woodcut works that engage the lives and stories of the people in Kerala, made with communities using the historic technique of woodblock printing, often used in Asian activist work, to encourage them to express themselves. Chitra Ganesh (b. 1975 New York, USA). Lives and works in Brooklyn, New York. A series of colourful animations that responded to the Buddhist and Himalayan art collection at the Rubin Museum in New York. 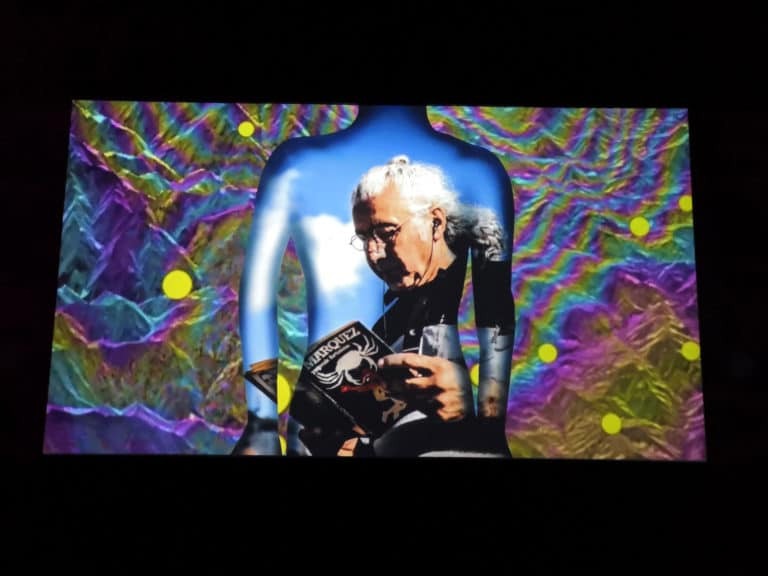 They feature Maitreya, a future iteration of the Buddha, coupled with photojournalist images of recent activism such as Black Lives Matter and #MeToo in a frenzied and apocalyptic world. Marzia Farhana (b. 1985, Dhaka, Bangladesh). Lives and works in Dhaka. Ecocide and the Rise of Free Fall was created using materials that were collected from the floods in Kerala. Lifted off the floor and hanging from the ceiling, the artist says the pieces were “trapped within an irresistible fall”. We also loved Sunil Gupta and Charan Singh’s Dissent and Desire photography installation, Shilpa Gupta’s extraordinary For, In Your Tongue, I Can Not Fit – 100 Jailed Poets, Lubna Chowdhary’s Metropolis, and Shirin Neshat’s amazing two-screen film Turbulent. We could go on and on.